When Malala Yousafzay was awarded the Nobel Peace Prize, I of course, had to scour the web to find some info on her. And you should check out my post “Malala Yousafzay and Kailash Satyarthi and the Nobel Prize 2014” to read about how and why she earned the prize. As I read about her, I came across a line that mentioned that she was named after Malalai, an Afghan heroine. So, off I went again in search of info on Malalai. I was all set to gather and collate and draft something, when I came across this blog by Garen Ewing, http://www.garenewing.co.uk/angloafghanwar/biography/malalai.php, which I happily share with you here! Indeed, I am happy to celebrate two young women (Malala and Malalai) who dedicated their lives to working for human rights!! While in Britain, no one has heard of her, in Afghanstan Malalai (or Malala) is a legend. 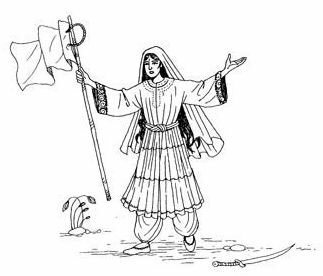 Smaller facts in the story vary slightly, but although it is Ayub Khan who became known as the Victor of Maiwand, it is said that it was Malalai who actually saved the day. But then Malalai was herself struck down and killed. However, her words had spurred on her countrymen and soon the British lines gave way, broke and turned, leading to a disastrous retreat back to Kandahar and the biggest defeat for the Anglo-Indian army in the Second Afghan War. Ayub Khan afterwards gave a special honour to Malalai and she was buried at her village, where her grave can still be found. British sources, unsurprisingly, do not mention Malalai. Her actions may not have been noticed by any of the British, or they may not have seemed as consequential as they were to the Afghans. Afghan women are very rarely mentioned at all in the reports and narratives of the war (Hensman mentions that one woman was found among the dead at Ahmed Khel). Interestingly, it is the Afghans who provide some of the evidence for one of the other legends born at the battle of Maiwand, as it is from one of Ayub’s artillery colonels that we learn some of the details of the famous last stand of the 66th, clutching to their company colours, in a Khig garden, where indeed the fallen bodies were later found to be lying. As well as Malalai, there were many other factors in the Afgan’s favour on that day, including preferential terrain and positioning, superior numbers, skilled use of outnumbering artillery, and perhaps some bad decisions on the British side of things. But certainly her actions were enough to turn her into a national hero where she is still revered today. Schools, hospitals and even a women’s magazine have been named after her. It is also a popular girl’s name, with Malalai Joya a rare female voice in post-Taliban Afghan politics. Article by Garen Ewing ©2005. Separate from other articles on this website, I grant a creative commons license so this article may be used elsewhere to spread the word about Malalai. Please include this credit line.